Oatmeal has long been a staple of the American diet, while quinoa has become widely available only within the past several years. Even though it's actually a seed, quinoa is cooked like a grain, and the U.S. Department of Agriculture considers it a part of the grain food group — the same group that includes oatmeal. Both quinoa and oatmeal provide health benefits and fit well into a balanced and healthful diet, but they have several nutritional differences that might affect which grain you prefer. One of quinoa's main nutritional advantages is its high protein content, containing more protein per serving than oatmeal. Each cup of cooked quinoa provides 8 grams of protein, compared to 6 grams in an equivalent portion of cooked oatmeal. Quinoa also surpasses oatmeal in protein quality: The complete protein in quinoa contains all the essential amino acids you need from your diet, while oatmeal's protein provides only some of the essential amino acids. This means that quinoa provides every type of amino acid your body needs to maintain healthy tissue, support immune function and transport oxygen to your tissues. Quinoa and oatmeal both serve as excellent sources of fiber, although quinoa provides slightly more fiber per serving. Adding fiber to your diet not only promotes digestive health — it fights constipation and helps control digestive disorders like diverticulosis — but fiber also fights hunger, combats obesity and prevents Type 2 diabetes. A cup of cooked quinoa boasts a fiber content of 5 grams, which fulfills 14 percent of the recommended daily fiber intake for women and 20 percent for men, according to the Institute of Medicine. Oatmeal still offers a generous amount of fiber, at 4 grams per cup. Quinoa and oatmeal contain different amounts of micronutrients — a category of nutrients that includes vitamins and minerals — but both come packed with nutrition. Quinoa comes out ahead when it comes to its magnesium content — it offers 118 milligrams per serving, compared to oatmeal's 61 milligrams — but oatmeal offers more than five times the amount of iron found in quinoa. Magnesium and iron allow your cells to produce energy. Iron promotes red blood cell function, while magnesium contributes to healthy bones and teeth. 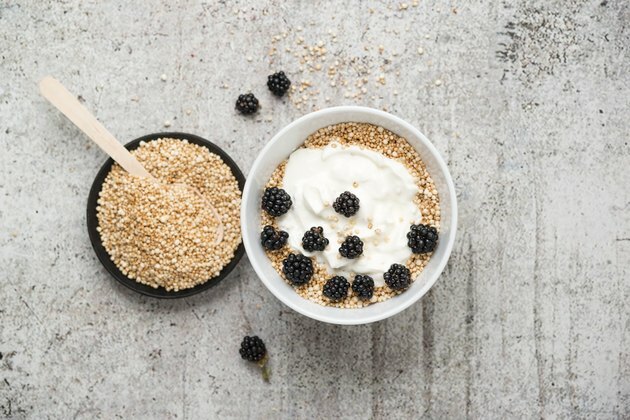 Both oatmeal and quinoa serve as excellent sources of folate, or vitamin B-9, a nutrient that supports your metabolism and plays a role in mental health. Enjoy oatmeal topped with fresh fruit, seeds and grains, or get more creative in the kitchen with baked oatmeal. Combine rolled oats with milk — or plant-based milk alternatives — egg whites, ground flaxseed, applesauce and mixed berries, and then bake until set. Experiment with quinoa in your breakfasts; try cooking it in milk, similar to oatmeal, and top it with a mixture of fruits and nuts. A bowl of red quinoa topped with pistachios and mandarin orange slices not only makes for an aesthetically pleasing breakfast, it also comes packed with nutrients. Alternatively, use quinoa in place of rice or couscous in salads, casseroles or soups.